According to TechSci Research report, “India Modular Kitchen Market By Design, By Product Type, By Sales Category, Competition, Forecast & Opportunities, 2014 – 2024”, modular kitchen market in India is projected to grow at a CAGR of 27% during the forecast period (2019-2024). Kitchens are certainly getting a lot more recognition in the home improvement category to enhance both its functionality and decor. Be it homemakers or working professionals, restructuring and remodeling the kitchen to a more appealing one has recently become a huge trend. Over the last few years, kitchen industry in India witnessed an inclination towards modern designs and comfort. Amid Indian consumers, kitchen is no longer perceived as a separate entity, but an often space for socializing, relaxation and imaginativeness. With consumers showcasing willingness to experiment with design, textures and naïve color combinations, manufacturers have been set free to offer consumers with world class products. Consumers are increasingly looking at premium designs and features such as magic corners and kitchen island concepts to add more luxury touch to the cooking space. Browse 5 market data Tables and 26 Figures spread through 76 Pages and an in-depth TOC on "India Modular Kitchen Market"
Growing number of partnerships between real estate project developers and modular kitchen manufacturers, in addition to rising purchasing power, improving lifestyle and increasing number of residential construction projects are expected to push sales of modular kitchens in coming years. Livespace is one of the leading players in the online platform offering modular kitchen accessories. Launching its exclusive Modular Kitchen business segment in December 2015, the company partnered with Brand Capital in October 2018, the strategic investment arm of The Times Group, and was able to create a strong brand presence. Hettich India Private Limited, Godrej & Boyce Manufacturing Company Limited, Magppie Retail Limited, Hafele India Private Limited and Sleek International Private Limited are some of the leading players in India modular kitchen industry. “Indian modular kitchen manufacturers offer spectacular range of products focused largely towards a reputed establishment of modular kitchens in urban India. A defined price range of project execution also acts as a factor for the increasing popularity of modular kitchen concept. Almost 70% of the players in the industry are making modular kitchens in this price range. 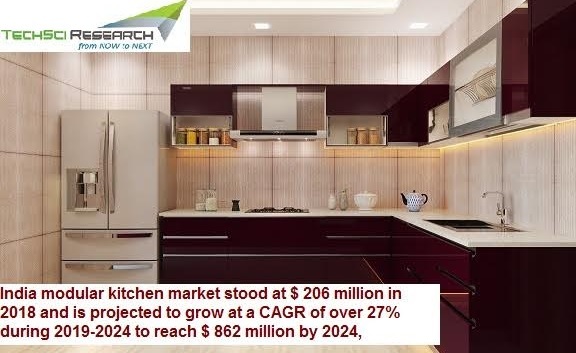 Surging number of working female professionals in India is also expected to positively impact the country’s modular kitchen market in coming years,”, said Mr. Karan Chechi, Research Director with TechSci Research, a research based global management consulting firm. “India Modular Kitchen Market By Design, By Product Type, By Sales Category, Competition, Forecast & Opportunities, 2014 – 2024” has evaluated the future growth potential of modular kitchen market in India and provides statistics and information on market structure, size, share and future growth. The report is intended to provide cutting-edge market intelligence and help decision makers to take sound investment decisions. Besides, the report also identifies and analyzes the emerging trends along with essential drivers, challenges and opportunities present in India modular kitchen Market.